CFCCA, Centre for Chinese Contemporary Art, Manchester, UK. Helen Couchman lived and worked in Beijing for nearly seven years, having arrived on the Trans-Mongolian Train No. 4 at Beijing Main Station in early 2006 and then leaving for a project in New York City at the end of 2012. In that period, she created a number of works. Some involved printmaking, both etching chine-collé and using a technique traditional to Beijing – woodblock printing. 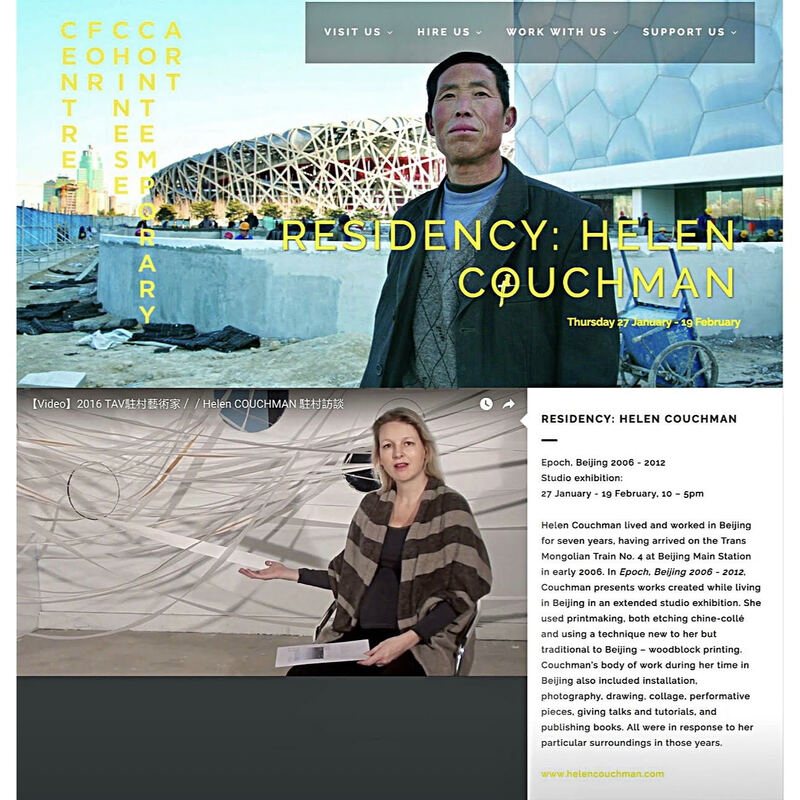 Couchman’s body of work during her time in Beijing also included installation, photography, drawing, collage, performative pieces, giving talks and tutorials, and publishing books. All were in response to her particular surroundings in those years. Those years. Ask any historian to define a period or an era. They argue endlessly about when one era ends, and another begins and over just what defines an age. How to identify the beginning of an era? What constitutes an epoch’s end? Looking back at the time between 2004-2013 from the perspective of the present, Couchman feels nostalgia for a moment come and gone. Beijing (or at least the nearby city of Zhangjiakou) is getting ready for the Winter Games of 2022. But compared to the excitement and anticipation which gripped the city and its people in the run up to the 2008 Summer Games, the atmosphere feels muted, the excitement less palpable. In 2008, China reached out to the world and Beijing was radically re-sculpted. The song, “Beijing Welcomes You,” was played almost non-stop that year as the city was made orderly for the games, but some asked who might be excluded from that welcome. An unintentionally prescient question it turns out, as the period Couchman worked in Beijing did constitute a particular era, one that in 2016 many look back upon with the same nostalgia as Couchman. The air is better in China in 2016 than it was a decade ago and new Internet applications make life for urbanites easier. The country is in a much stronger position internationally both in economic and strategic terms. No doubt these are successes. But there are growing restrictions on expression with new pressures on scholars, artists, and non-governmental organizations. The domestic Internet offers a range of conveniences at high speed, but access to the outside world shrinks year on year. Galleries close. Film festivals cancel. Critiques of the state and society are dismissed as being influenced by nefarious foreign forces. It is as chilly an intellectual and artistic climate as at any time in the past three decades. Couchman’s chose to work in Beijing, responding to Beijing in a particular period. These pieces represent a window not just into a recent past in Beijing and China, but also to an alternate vision of a future. One that embraces the kind of international cosmopolitanism celebrated in Beijing in 2008 and then again a year later with the Shanghai World Expo. The values of the Olympics, the opening of hearts and minds to friends from abroad, made this a special time for all living in Beijing. We are all products of our culture, but we are also products of a shared humanity. It is what connects art, subject, and viewer. It is what gives us common cause to embrace visitors to our home or to reach out across the world to make new friends. It was in this spirit that Couchman made these works, images of what turned out to be a very special era in Beijing. 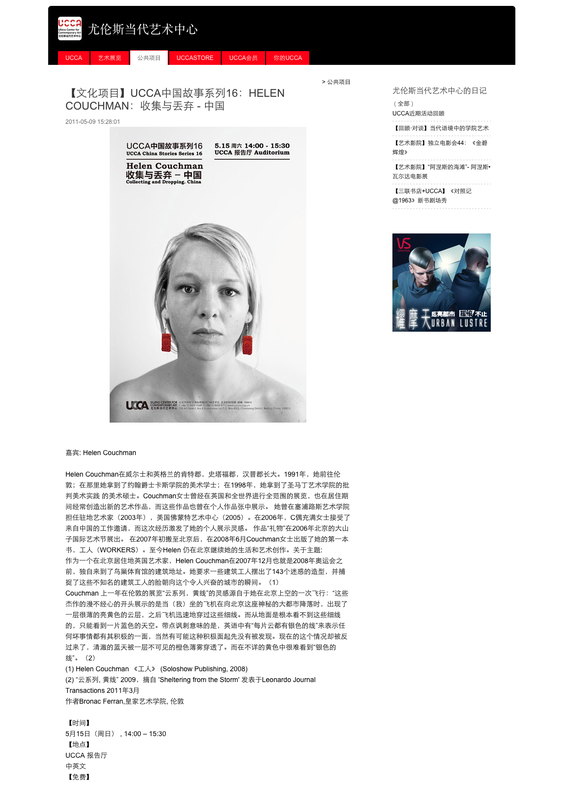 Poster on the UCCA, Ullens Centre for Contemporary Art, Beijing website. The image used is ‘Self portrait with Long Life Earrings’ by Helen Couchman for the artist’s talk, ‘China Stories – Collecting and Dropping, China.’ 2011.